If you thought £750 for a one-metre interconnect cable was expensive, think again. An old hi-fi rule of thumb was to spend ten percent of your total system budget on cables. If this holds true, much of the high-end hi-fi you see in the press these days will warrant a cable of this calibre. The wire in question is Atlas Cable's new Mavros, which is said to have been researched, designed and developed to be technically and sonically superior to the competition at any price! Standard copper has about 1,500 grains per foot. Audio signals have to traverse the junctions between these 1,500 grains in order to go from one end of foot-long cable to the other. The grain boundaries cause signal distortion. In comparison, the Mavros cable is made from an incredibly pure type of copper - the kind that typically has one grain per 700 feet - which presents no bother to the delicate signal as it travels along the cable. The Ohno Continuous Casting (OCC) process is explained here. The construction consists of a pair of conductors each made up from 73 strands of two different diameter wires. Each bunch of conductors is insulated by a layer of Micro porous PTFE and surrounded by a PEF (' Mylar') jacket, covered by a pure copper close-weave shielding braid. This is topped with a flexible PVC and then covered by a hardwearing layer of black woven cotton. 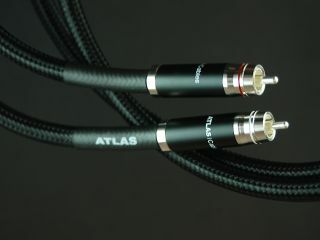 For added luxury, Atlas terminates the wire with its exclusive silver-plated, self-cleaning, RCA plugs.